Here is a Special Link to 1984 Graduates Guestbook . . .
A small group of members of the Grand Island High School Class of 1984 recently met at the Brick Oven to begin planning a 25th class reunion. The date of Friday, July 3, 2009 has been agreed upon. The committee is asking for ideas for a location before details can be worked out. Many classmates have opened accounts on Facebook and are communicating regularly. A Grand Island Class of '84 group has also been set up on Facebook. "We are asking that all class members send us their addresses, email and photos to barbbuellbrown@aol.com" Barb Brown said this week. "We need input as to how many classmates might be attending, event ideas and any input you might have." Classmates interested in helping with the planning are asked to contact Barb. Below is information about the Class of 1984 - 20th reunion. (left) (front) Lynn Stoberl Kelly, Amy Stoddard Davis, Lisa Kargatis Scalzo; (back) Jennifer Schmidt Peresie, Barbara Buell Brown, Jacque Goris Foote, Peg Pullano Carroll, Dolores Casey Sinicki, Michelle DiMartile. (left) Val Mysliwiec, Scott Hoffman, Dan Buscaglia, Steve Polizzi (not Class of '84) and Randy Howe. (Right) J Schorb, Al Wasse, Courtenay Watt, Aimee Jircitano Emmi. 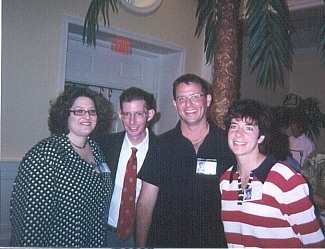 (left) Eli Sobus and wife, Scott Hoffman and date, Pat Neary and wife. 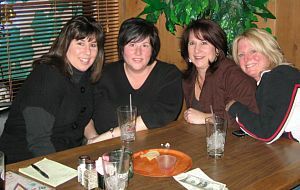 (right) Heather Smith Figler, Amy Stoddard Davis, Kelley Lee Timmer. Memory table of classmates who have passed. 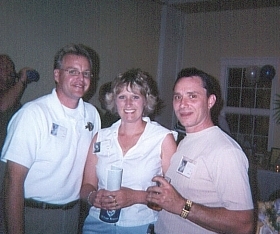 (right) Kevin Sommer, Debbie Chase Sommer, Rob Davisson. (Left) Harry Schottmiller. 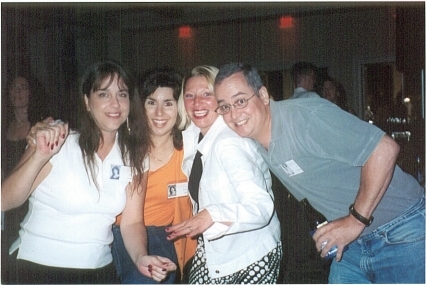 (right) Maria Godzisz, Barbara Buell Brown, Sandy Mills Gagola, Kevin Corcoran. Photos taken July 3, 2004 at the new Beaver Island Clubhouse. Photo by Mary Stewart - Click for larger view. 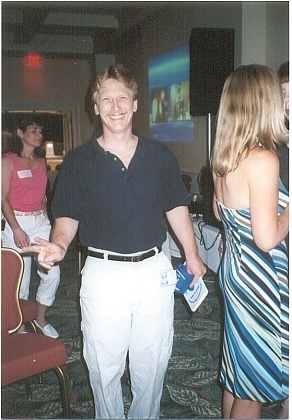 The next Class of 1984 Reunion meeting will be 6:30 p.m. Wednesday, June 2 , 2004. All classmates interested in helping are welcome to attend. Please contact carrollpeggym@aol.com for location and to RSVP if attending. Whether you are or are not attending, we still need all classmates to RSVP as soon as possible. We need a head count for the buffet, information for our memory book and surveys filled out and returned. July 2 is our main event for the Reunion weekend. It is a casual evening - not formal! So come and enjoy. We have many things planned for the night. We will have a DJ playing all our favorite 80’s tunes all night, raffles, buffet, slide show (send those pictures we know you all have), good conversation and you can walk down to the beach or take a stroll on the board walk. The new Beaver Island Clubhouse is wonderful – come see for yourself. Also, we are in need of a flat bed/trailer to use for the Parade. Please contact Caseygoris84@hotmail.com if you can help! 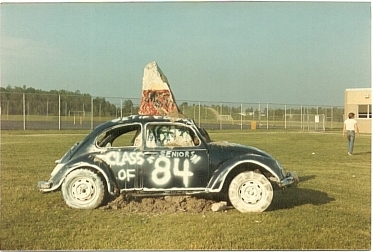 We will soon have our own Web site just for the Class of 1984. So please check back often for a link to our new site. There are still several missing classmates! Please review the list and forward all info to any committee members as soon as possible. The Reunion is only six weeks away - can you believe it. Can’t wait to see all of you! 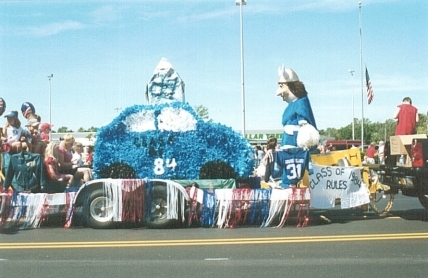 The next Planning Meeting for the 20th reunion of the Class of 1984 is scheduled for May 19th at 6:30 p.m. with a Parade "Float" meeting to follow at 7:30 p.m. (to plan our float). Contact Caseygoris84@hotmail.com for location and RSVP if attending. We want to thank everyone who has sent an RSVP, and we are looking forward to seeing you! The RSVP date has been extended for all who still have their invitation on the refrigerator! - please respond ASAP. Scroll down or click Dinner Information for complete details on July 4th reunion weekend events. Click Class of '84 Missing Persons List and forward any information to Peg Carroll at Carrollpeggym@aol.com or any committee member. Scroll up for committee and down for more reunion information. Scroll up for missing persons list and down for information on the July 3, 2004 reunion in the new Beaver Island Clubhouse. The next Planning Meeting for the 20th reunion of the Class of 1984 is scheduled for Thursday, February 5th at 7 p.m. - call for location! We are still searching for many classmates. 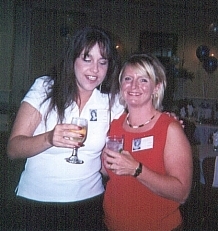 Please tell everyone to check out Isledegrande.com for up-to-date info on our Reunion. Please forward Name, Address, Phone # and E-mail address to contacts listed above. We will post a list of missing classmates shortly! SUNDAY - JULY 4TH - Golf in the morning for anyone interested, please let us know so we can make the proper arrangements. PICNIC/FAMILY DAY - BEAVER ISLAND PARK SHELTER from NOON until? We would appreciate any donation from our classmates to help with raffles and gift baskets. We need pictures and memorabilia! Anyone wishing to place an AD in our MEMORY BOOK, E-mail us for prices. We will keep posting updates so make sure you check back to this wonderful web site and please sign Isledegrande's guest book. Spread the news!!!!!!!!!!!!!!!! 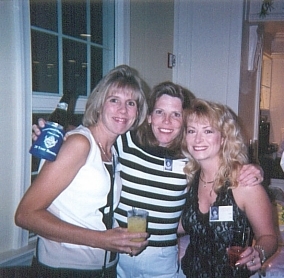 Members of the Class of '84 are planning to have our 20th reunion July 4th weekend: Friday Night (July 2), Saturday Parade (July 3rd) and Sunday Family Day (July 4th). Please E-mail all contact information to the E-mail addresses listed above. The next meeting is Monday, January 26, 2004 at 7:30 p.m. Call for location! If anyone knows how to get a hold of Debbie Lee, please let us know. Attention members of the GIHS Class of 1984. This page is for you to post any and all information on a 30th reunion if you are planning one. Email information for this page to teddy@giecom.net.